The Unofficial Shelvoke & Drewry Website. appropriate to launch a Club for anyone with an interest in Shelvoke & Drewry. It soon became apparent that a means of communication was needed other than the Internet as many former employees weren't on the Internet. In March 2003 an A5 size quarterly magazine was launched and continued until the end of 2010 with 32 issues being produced. At its peak 160 copies were printed and posted per issue. Until the later years printing, stapling, and posting was all done at home. By 2010 this was felt to be too onerous and the magazine was replaced by an easily printable Newsletter on the webpage, and this practice continues with 29 issues having been produced to date. [February 2018]. Unfortunately this change inevitably meant that contact with some enthusiasts has been lost. On September 12th 2004 the first event organised by the SD Enthusiasts' Club was held at Letchworth Hall Hotel's Arlington Suite, under the title 'SD Remembered'. This accommodates 200 people and all the tickets were sold with unfortunately a waiting list. A buffet supper was provided, memorabilia was displayed and seven preserved vehicles were on display. In 2005 the Club were invited to attend the Bedfordshire Steam & Country Fayre at Old Warden (near Bigglewade) on 17th & 18th September. A display tent was provided and eight preserved vehicles were displayed and driven into the parade ring each day. The event was titled: 'SD Celebrated' and is shown above. a buffet meal and display of memorabilia.Steve Jones brought his 1982 PN Revopak over from the Isle of Wight for the event. In 2009 & 2010 preserved vehicles were displayed at the Southern Counties Historic Vehicles Preservation Trust's rallies at Edenbridge, Kent, in June. 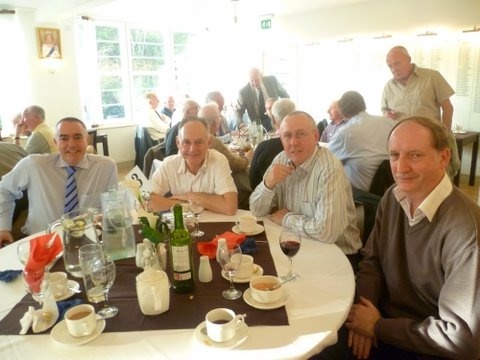 In November 2011 in conjunction with the Enthusiasts' Club, former SD apprentice, Bob Bowker, organised a reunion lunch [shown above] for former apprentices at the Letchworth Garden City Golf House. Former Managing Director, and an ex-SD apprentice, Stan Quin, addressed the gathering of over thirty former apprentices. No further gatherings have been arranged to date. In January 2016 a Facebook Group was created as a further means of communication between SD enthusiasts. This has proved to be a successful way of keeping in touch. The Group numbers over 230 members. Over the years many people have been generous in sharing their memories of Shelvoke & Drewry and I believe that the Enthusiasts' Club has fulfilled its purpose of keeping memories of the Company alive. To me it has provided many hours of interesting work which is continuing. For other pages click below.